I’m with Jessica. I arrange usually color within function as well. More like type. Like dressy, long sleeve, short sleeve, hoodie/heavy. Pants are sorted dressy, jeans, shorts. I also have a spot for everything at one time. It’s called the floor. My question to you, Mary, is, “Where are Chris’s clothes?” Is he allowed to have any or is this space strictly yours only? HAHA. 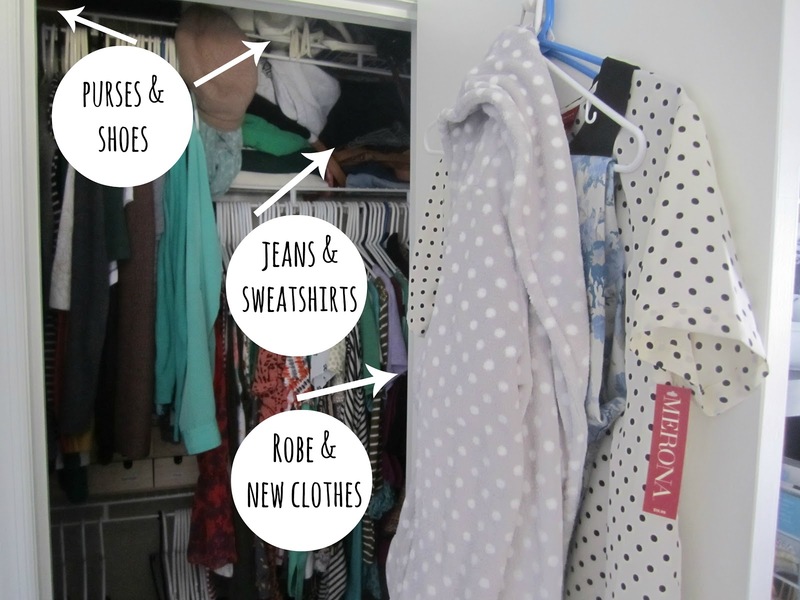 I loved your organising of clothes. Going to do that for my clothes too. Just a suggestion for organising shoes. I do that by putting couple of pairs in one shoe box in polythene and pasting a photo of the shoes on the fronth of the box. This way, I can stack the shoe boxes one over the other, know which box has which shoe and prevent them from getting dirty. I think I saw a little space behind your pants. You already have a couple of shoe boxes visible. If you could put some sort of shelf behind your pants, you could put shoe boxes parallel to the wall on about three shelves. I do share my walk-in with my husband – I have 3/4 and he has 1/4. 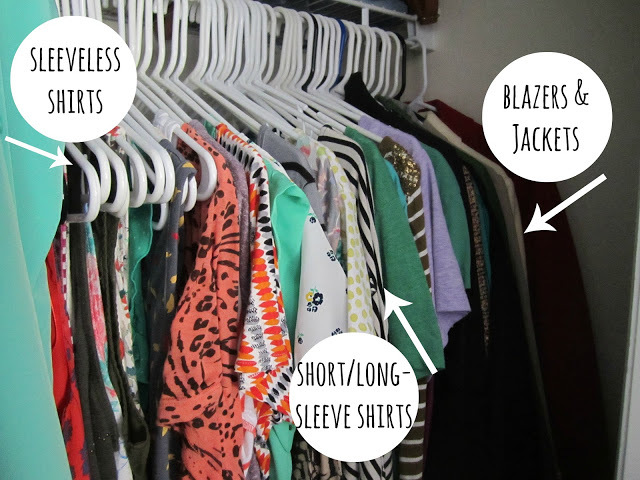 I wear mostly outfits with jackets – those are hung by color and there is another hanging rack below that for all the tops that go with those jackets. 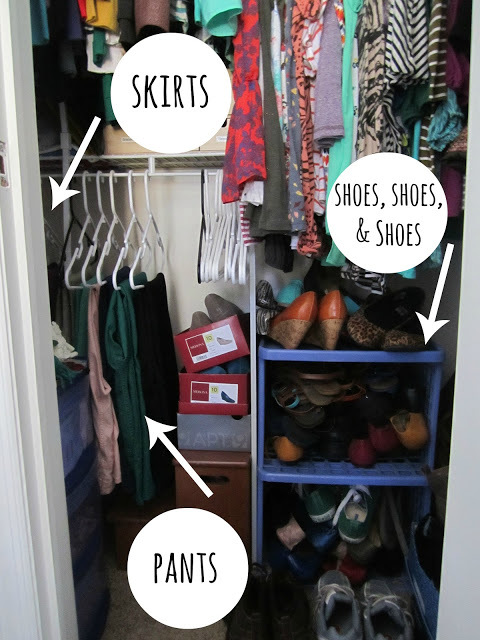 Along the back wall of the closet go all pants, hung full length on skirt hangers, with multi-hangers as well. 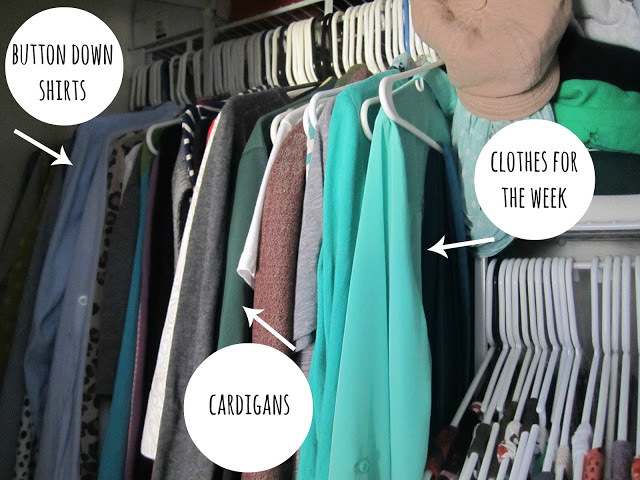 On the other long wall, that is double hung has my home-clothes/knits/gym clothes. On the shelf underneath there are my purses. On the hanging rack under that shelf are old clothes I’m hanging on to. 🙁 plus two stacks of shoe boxes. In the center of that side wall is a section of floor to ceiling shelves where most of my shoes are. 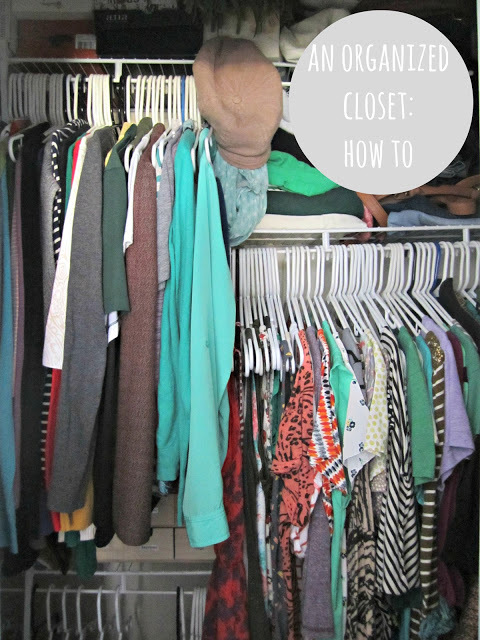 The last double hung section is where all my husband’s clothes are:) He (I mean, I) fold the rest of his clothes for his armoire, so, he really doesn’t ‘need’ more closet space. In addition, there is another shelf above all the hanging racks that goes all the way around the closet – I have more shoes up there, which I probably need to get rid of. I have hooks on the wall behind the closet door where I hang my nightie and robe and whatever I just took off.